Before St Kilda's Nicky Winmar made his celebrated stand against racism at Victoria Park, before North Melbourne’s Jim and Phil Krakouer redefined the art of ball-handling, and before a succession of brilliant aboriginal small forwards transformed the forward pocket from a respite station for tired rovers into a major avenue to goal, there was the mercurial Syd Jackson; a gifted, courageous aboriginal footballer from Western Australia who was a star in two Carlton Premiership teams. 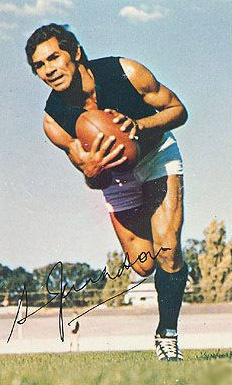 Jackson’s remarkable ability on the football field was first discovered by the East Perth Football Club in 1963. Back then Syd was a scrawny, spindly-legged teenager from Roelands Mission near Bunbury. There wasn’t much of him, but he certainly knew how to find and use the football, and within a few months he was entrenched in the centre for the Royals. In that first season in the WANFL, he scored more votes than anyone else in the Sandover Medal (WA’s equivalent of the Brownlow) but was ruled ineligible for the honour because he had been suspended during the year. That effort brought strong overtures from two VFL clubs; North Melbourne and Carlton. Syd was reluctant to leave WA at first, but after repeated invitations he eventually agreed to join the Blues in 1968. By then he was a mature 24, with more than 100 senior games to his credit. A lucrative transfer fee was agreed on, and East Perth agreed to clear Syd to Carlton. Then the WANFL stepped in. Alarmed by the drain of their finest players from Perth to Melbourne, the West Australians decided to make a stand, and refused to endorse Jackson’s transfer. Syd’s only option then was to stand out of football for a year. Under ANFC rules, players who took this course of action were granted automatic clearance after twelve months. Consequently, Jackson spent his first year at Carlton as coach Ron Barassi’s runner – which at least gave him some valuable insights into Barassi’s methods. It also got his career at Princes Park off to a positive start, when the Blues beat Essendon for the 1968 Premiership. Syd pulled on the famous navy blue guernsey number 5 for his first match in round one of 1969, against Richmond. He had played almost all of his senior football in WA in the centre, but Barassi had reservations about Jackson’s slim frame in heavy traffic at VFL level. Instead, he preferred to use him as a creative half-forward flanker, and like most of Barassi’s ideas at the time, it proved a winner. Jackson had an impressive debut season, using his lightning pace and accurate disposal with telling effect. An intuitive reader of the ball as it spilled off packs, and a driving drop-kick on the run, Syd was instrumental in Carlton finishing second on the ladder by percentage to Collingwood. But after jumping to outright favouritism for the flag with a decisive six goal defeat of the Magpies in the Second Semi, Carlton were no match for a rampaging Richmond in the ‘69 Grand Final, losing by 25 points. At the same time, Jackson’s protracted entry into VFL football was not without controversy. He was the only aboriginal playing at the top level, and a potential match-winner every week. So as his career progressed, he was subjected to increasingly racist taunts from opponents and opposition supporters. Much of this he ignored, but occasionally the physical and verbal pressure reached a point where retaliation was an understandable response. Only his team-mates knew what Syd was going through, and he was highly respected for his dignified response on most occasions. However when Jackson did occasionally snap, the Blueboys were always there in numbers to support him. One such blow up occurred at a crucial time for Jackson and for Carlton, during the Blues’ Second Semi-Final loss to Collingwood in 1970. Syd was reported for striking Magpie defender Lee Adamson, and seemed likely to be suspended for the rest of the finals. Enter Carlton President George Harris, who persuaded Jackson to tell the tribunal that Adamson had racially abused him. Syd complied, pleading not guilty due to extreme provocation. To Jackson and Carlton’s relief, the tribunal accepted Jackson’s story and exonerated him. Years later, Syd owned up to the truth and apologised to Adamson, saying that while Adamson didn’t say what Jackson said he did, there were many others who had overstepped the mark, so justice was done in the end. Five days after that tribunal hearing, Carlton beat St Kilda in the Preliminary Final, earning another crack at Collingwood for the flag. In his second season, Jackson, promising youngster Robert Walls and Tasmanian recruit Brent Crosswell had already formed one of Carlton’s best-ever half-forward lines. However they, along with the rest of the team, seemed headed for defeat when the siren sounded for half-time in the Grand Final. The Blues had been totally outplayed by their bitter rivals to that point, and were seven goals down. Carlton’s epic comeback that day was sparked by coach Ron Barassi, and led by 19th man Ted Hopkins, who came off the bench to post four goals in the greatest of all of Carlton’s Grand Final victories. Crosswell was widely regarded as Best on Ground, while Walls and Jackson together chopped up the Collingwood defence with their pace and marking power. Carlton’s fabulous ten-point win sent Lygon Street into raptures, and shattered Collingwood’s finals confidence for more than a decade. Two years later, Jackson won his second Premiership medal when Carlton upset another traditional rival; Richmond, in another Grand Final triumph. Coming off three successive hard-fought lead-up finals, Carlton faced a full-strength Tiger team refreshed after a week’s break. With nothing to lose, Blues’ captain-coach John Nicholls opted for a bold plan of outright attack, and shuffled his team in a bid to unsettle the hot favourites. Big Nick’s plan worked superbly. The Blues blitzed Richmond from the first bounce, slamming on eight goals in the first quarter, and ten in the second, on the way to a record Grand Final score of 28.9 (177). Richmond outscored the Blues in the last quarter when the game was all over, but the final margin of 27 points flattered the Tigers. Nicholls, Walls and Jackson all starred for the Blues, with 14 goals between them. That second Premiership medal marked the high point of Syd’s career with the Blues. Injury kept him out of the 1973 final series, although he returned to near his best before John Nicholls retired as coach in ’75. After one last season in 1976, Jackson decided that his playing days at Carlton were over. He left Princes Park as one of the most popular players of his time, and, at the age of 32, played in one last Grand Final for SA club Glenelg in their 1977 loss to Port Adelaide. After football, Syd became heavily involved in Aboriginal Affairs. He served as CEO of the National Aboriginal Sports Foundation for a number of years, and has continued to use his profile to advance the cause of indigenous Australia. In 2005 he was named in the AFL Players Association Indigenous Team of the Century, and a year later became the Carlton Heroes’ inaugural inductee into the Carlton Hall of Fame - an honour that everyone who saw him play would agree, was richly deserved. Time did not diminish Syd’s standing within the game, and in 2015 he was inducted into the West Australian Football Hall of Fame. Later that year, Carlton launched the Syd Jackson Scholarship, which aims to accelerate economic freedom, employment and wellbeing, for young Indigenous Australians. Each year, the recipient of the scholarship will benefit from mentoring sessions with Syd, current Carlton players and other Outback Academy mentors as part of a nationally recognised training course. Contributors to this page: Jarusa , PatsFitztrick , molsey , Bombasheldon , WillowBlue , pblue , true_blue24 , nikki , admin and camelboy . Page last modified on Tuesday 09 of May, 2017 22:15:42 AEST by Jarusa. 1972 Prelim. Final - Blues scrape into Grand Final.